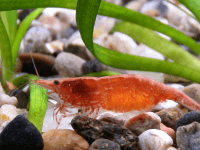 Crystal Red Shrimps are fascinating shrimps for the experienced hobbyist, but due to their sensitivity to water quality they are probably not the best choice for the beginner. 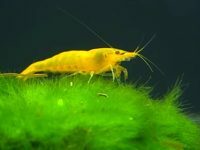 Aquarium enthusiasts who have experienced success with easier varieties of shrimp may want to tackle crystal reds after they have learned how to adjust the water quality in their tanks to keep ammonia and nitrate levels near zero. All that hard work will be rewarded when those hobbyists get their first glimpse of these strikingly beautiful shrimps moving through the gravel like an aquatic cleanup crew. The Crystal Red Shrimp is actually a color variation of the popular bee shrimp. They are the same species, just with a different – and quite striking – color. Hobbyists have obtained this spectacular color through years of selective breeding, much the same way as they have in Guppies, Bettas and other varieties of fish. Distribution: Crystal Red Shrimp is a bred variant of Bee Shrimps. Crystal Red shrimps are often graded on a scale of quality denoted as C, B, A, S, SS and SSS, the latter denoting highest quality. 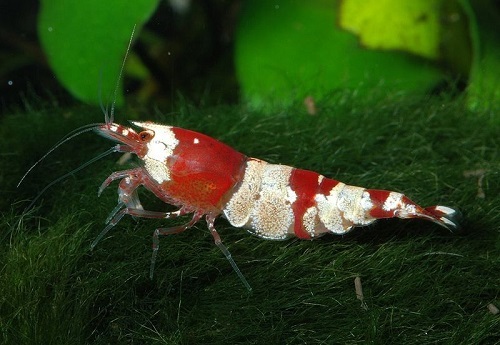 The grading of the Crystal Red Shrimp is based on the color and distribution of the markings, and can be very subjective. Some shrimp breeders’ websites have charts showing examples of the various grades. Unlike many other varieties of shrimp, the crystal red shrimp is very sensitive to water conditions. While other varieties like the yellow shrimp can often withstand less than optimal temperatures and water parameters, the crystal red shrimp cannot, so it is very important for hobbyists to have their water tested before acquiring a colony of these shrimps. In order to successfully keep crystal reds there can be no ammonia or nitrites in the tank, so be sure to have your water tested for these contaminants before buying your first shrimp. Most shrimp do better in alkaline to neutral pH because their shells are composed of alkaline materials, and too high acidity is harmful to those shells. However, the best pH level for the crystal red shrimp is between 6.4 and 6.8. 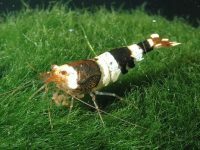 If you notice your shrimps constantly trying to brush things off their bodies it could be an indication that the pH level is too acidic. The most common problem overlooked by hobbyists is TDS. Sometimes, all the water parameters look correct, but the shrimps keeps dying. If the TDS exceeds 150 and your pH is on the higher range, nitrogenous waste can turn toxic. You can buy a TDS meter to measure the amount of dissolved substance in your tank. Water changes are important when keeping crystal red shrimp. For best results weekly 30% water changes are recommended. When changing the water make sure the water is properly aerated and free of chlorine, and be sure to add the new water slowly to avoid temperature shocks and other potential problems. Healthy crystal red shrimps will be constantly on the move, looking for food on the bottom of the tank and cleaning up the particles of food other residents of the tank have overlooked. 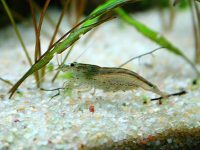 Shrimps that are sitting still on the bottom of the tank or moving lethargically is definitely a bad sign – if you notice this kind of behavior it is important to test your water at once. In addition to the food they find while scavenging and cleaning the tank, crystal red shrimps will need a varied diet in order to stay healthy. These shrimps are omnivores, but a diet rich in vegetable matter is generally best. Many hobbyists like to plant a clump of moss in tanks that are home to a colony of these shrimps – crystal reds love the moss and it will help to keep them happy and healthy. Crystal reds will also eat algae, but if there is excessive algae growth in the tank the water quality may be too poor to successfully keep these sensitive creatures. It is a good idea to keep these shrimps in a planted tank – this will give them ready access to healthy food whenever they need it.